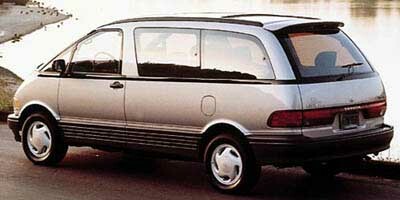 The Toyota Previa, sold from 1991 through 1997, was Toyota's second attempt at selling a minivan in the U.S. market. While it fared better than the small and square-cut Toyota Van it replaced, the Previa's unusual design and high price kept it from successfully competing with the Dodge Caravan and Chrysler Town & Country that launched the U.S. minivan category in the mid-1980s and dominated the market by the 1990s. The Previa's smooth, rounded shape had a vestigial hood at the front, along with a conventional grille, but its engine was located in the middle of the vehicle, driving the rear wheels. The 135-horsepower 2.4-liter four-cylinder engine was paired with the choice of a five-speed manual gearbox or a four-speed automatic transmission. All-wheel drive was available as an option, on a model known as the Previa All-Trac. While it gave the van good weight balance on the road, the centrally-located engine took up noticeable interior space. More challenging yet, the van's designers had only shaped the engine box for a four-cylinder engine, meaning Toyota could not fit the Previa with a V-6 engine to compete with the faster and more powerful Chrysler minivans--or those from Ford and General Motors as well. To address complaints from buyers and dealers that the Previa was simply too slow in modern traffic, Toyota boosted the engine's power to 160 hp in 1994 by adding a supercharger to create the Previa S/C model. The more powerful engine was an option for 1994 (on the LE model) and 1995 (on all trim levels), available only with the automatic transmission, and it was made standard equipment for 1996 and 1997. The new and more powerful engine had little effect on the Previa's fuel efficiency, which had started out in 1991 at 18 mpg combined for the rear-wheel-drive model and 17 mpg for the All-Trac. The 1997 Previa was rated at the same 17 mpg combined with either drive system. For 1998, the Japan-made Previa was replaced by an all-new minivan, designed just for North American market conditions and needs and built in the U.S. The Toyota Sienna, as it was named, offered four- and six-cylinder engines mounted in the front, driving the front wheels, again with all-wheel drive available. Within just a few years, the more conventional design, along with a similar effort from Honda called the Odyssey, turned the U.S. minivan market into a three-way competition among Chrysler, Honda, and Toyota--a feat the unusual Previa had never been able to accomplish.